Release Date: October 14th, 2005 (NYC-Angelika Film Center) by Magnolia Pictures. 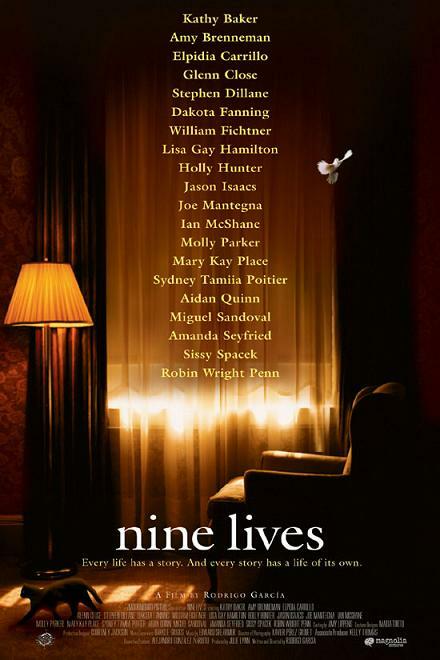 The Cast: Aomawa Baker, Kathy Baker, Andrew Borba, Amy Brenneman, K. Callan, Elpidia, Glenn Close, Stephen Dillane, Mary Pat Dowhy, Dakota Fanning, William Fichter, Lisa Gay Hamilton, Holly Hunter, Jason Isaacs, Amy Lippens, Joe Mantegna, Ian McShane, Daniel Edward Mora, Pat Musick, Molly Parker, Mary Kay Place, Sydney Tamiia Poiter, Lawrence Pressman, Aidan Quinn, Chelsea Rendon, Miguel Sandoval, Amanda Seyfried, Sissey Spacek, Rebecca Tilney, Andy Umberger, Robin Wright Penn. BASIC PREMISE: No, this is not a movie about a cat or even with any cats. It is about nine different women who deal with serious issues and conflicts within their lives..
ENTERTAINMENT VALUE: This film is organized into nine approximately 10-minute vignettes of each struggling woman. Each vignette feels like a documentary because they each have a title caption that states the women’s names and each one is well-acted. Some of the actresses are unrecognizable, while others like Sissy Spacek, Holly Hunter, Molly Parker and Glenn Close are quite the contrary. Nonetheless, each actress gives a bold and honest performance. Some of the stories are light and easy to watch, while others are more difficult. Not every story is engaging because they are all so different in terms of how much action and dialogue there is. The first segment is when a mother (Carillo) begs to speak to her beloved young daughter in prison. This scene is dramatic and full of energy. In another story, a woman ends up pointing a gun in her own face. Robin Wright Penn’s scene with Aidan Quinn is the most beautifully-written and ends on a very realistic note without much melodrama. It is interesting how the lives of some of the women are connected in subtle ways, but not all of them are. It would have been more engaging had writer-director Rodrigo García chosen 4 or 5 characters and focused more on them so that the audience can get to know them a little better. SPIRITUAL VALUE: Life isn’t easy for any of these women. Each of the women deals with grief or regret in different ways. Some of them turn their frustrations onto themselves, some turn it against others, and some bottle their feelings inside. There are a few emotionally-charged scenes, but they are all-too brief to amount to anything profoundly insightful or inspiring. INSULT TO YOUR INTELLIGENCE: Too many stories with not enough focus. THE BOTTOM LINE: Nine well-acted vignettes, many of which are interesting, but, ultimately, there is not enough focus for one to be thoroughly engaged in the women’s lives.